A note: I’ve officiated funerals, but I’ve never presided at a memorial and dedication of a Ghost Bike before. I am grateful to be entrusted with such holy work, as a pastor & as a cyclist. Many of Marcia’s long time friends gathered around. Many cyclists, many who never met Marcia, gathered around too- maybe for the same reason I did: the sharp awareness that we ride these streets just like Marcia did. In urban cycling, there is a term called “taking the lane,” which means moving from the edge of the road and into the center lane. Taking the lane means taking your rightful space, maybe even moving to a space that’s safer. In the testimonials from Marcia’s friends today, we heard about a woman who took the lane for herself, and made space for others. I wish I had met Marcia in person. I grieve her death. 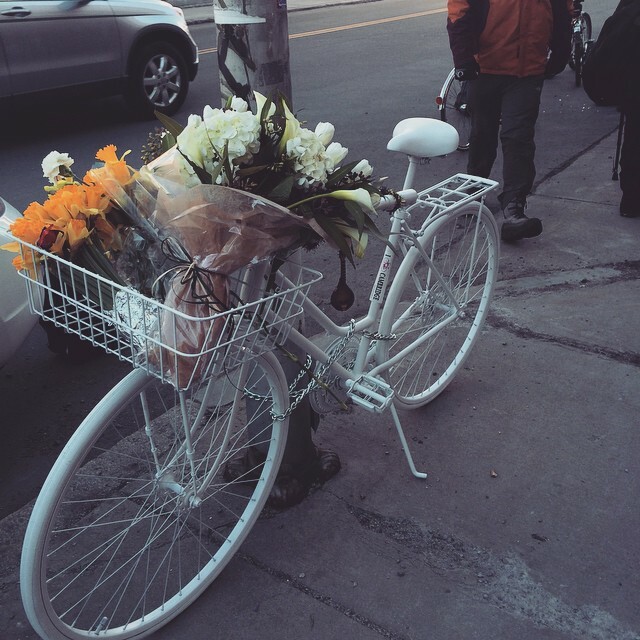 History of Ghost Bikes: Cyclist & Advocate Jessica Mink shared a brief history of Ghost Bikes, the white bicycle memorials created for fallen cyclists placed at the location of their death. Jessica also invited Marcia’s friends to advocate for safer roads and such actions as guards on trucks, through organizations like Boston Cyclists Union, Livable Streets, Mass Bike, and Cambridge Bikes. Invitation to Marcia’s Funeral: Rev. Betsy Sowers of Old Cambridge Baptist Church invited everyone to attend Marcia’s funeral on Saturday April 25, 2pm, 1151 Massachusetts Avenue, Cambridge. Song: “Meditation on Breathing” by Sarah Dan Jones Breathe in, breathe out. // When I breathe in, I breathe in peace. When I breathe out, I breathe out love. Memories of Marcia: Many from Marcia’s web of relationships spoke: friends, fellow singers, neighbors, fellow letter writers, women with Marcia who founded the bisexual community in Boston, co-workers from Harvard libraries, and members of Old Cambridge Baptist Church where Marcia sang in the choir. Many roads brought us safely here, to this small square of earth. We stand and ride on holy ground. We gather in grief to remember a life well lived, and a song beautifully sung. We praise you for the life of Marcia and for the time she spent among us. We give thanks for the fierce beauty of her life and the depths of her commitment to make this world a little kinder, a little more just. remind us, Holy One, of Marcia. Comfort all who mourn this day. We who continue to ride these roads confess that some days we ride scared, some days we ride angry. Here, on this holy ground, we pray and recommit ourselves to work for a day when all people will be safe on these streets. Friends, reach out your hands to bless. Today, on this holy ground, we dedicate and bless this ghost bike. May all who look upon it be reminded of the awesome responsibility of driving cars and trucks. May this ghost bike be a sign and a signal. Bless this memorial to Marcia. And bless us too. God, bless our bikes. Pour out your protection on our helmets. Take our handlebars and steer us ever true. Bless our wheels that move upon your good Creation. Anoint our brakes that we may know our limits. Fix our seat that whenever we roam, we might always return safely. Send down your Spirit with a blessing upon these bikes, that fortified by the might of your heavenly protection, these bikes may be help and aid unto all who make use of them. May our wheels rise. We send up glory, both now and ever, and to the ages of ages. Many roads brought us safely here, to this small square of earth. Now we ask you to guide us safely home. Holy One, guide our wheels and guard our coming and going. We give thanks for the life of Marcia, a woman of deep conviction and public witness. Today, in her honor, we ring out our bells of freedom, we sing out our song about love between our brothers and our sisters, all over this land. Cyclists and friends, will you ring your bell and say Amen?